Pope Emeritus Benedict XVI (Latin: Benedictus PP. XVI; German: Benedikt XVI; Italian: Benedetto XVI, born Joseph Aloisius Ratzinger on 16 April 1927) is Pope Emeritus of the Catholic Church, having served as Pope from 2005 to 2013. In that position, he was both the leader of the Catholic Church and sovereign of the Vatican City State. 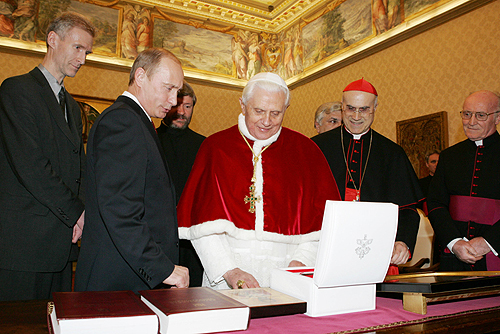 Benedict was elected on 19 April 2005 in a papal conclave following the death of Pope John Paul II, celebrated his papal inauguration Mass on 24 April 2005, and took possession of his cathedral, the Archbasilica of St. John Lateran, on 7 May 2005. On 11 February 2013, Benedict announced his resignation in a speech in Latin before the cardinals, citing a "lack of strength of mind and body" due to his advanced age. His resignation became effective on 28 February 2013. He is the first pope to resign since Pope Gregory XII in 1415, and the first to do so on his own initiative since Pope Celestine V in 1294. 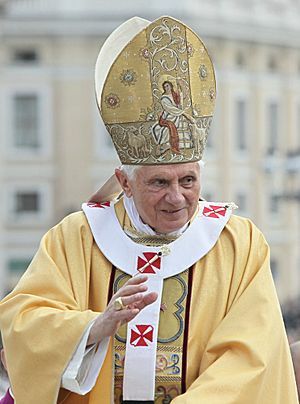 As pope emeritus, Benedict retains the style of His Holiness, and the title of Pope, and will continue to dress in the papal colour of white. He was succeeded by Pope Francis on 13 March 2013, and he moved into the newly renovated Mater Ecclesiae monastery for his retirement on 2 May 2013. Ratzinger was ordained as a Catholic priest in 1951. He was a professor at several German universities, including the University of Bonn and the University of Münster. He also taught at the University of Tübingen. and the University of Regensburg. In 1977, Ratzinger was named by Pope Paul VI as a Cardinal and the Archbishop of Munich and Freising. Cardinal Ratzinger was Prefect of the Congregation for the Doctrine of the Faith. He became Dean of the College of Cardinals. He was a close friend of Pope John Paul II. In 2005, Cardinal Ratzinger was elected Pope at the age of 78. At the conclave, "it was, if not Ratzinger, who? And as they came to know him, the question became, why not Ratzinger?" He chose to be called Benedict XVI. On 11 February 2013, the pope announced that he will abdicate or resign on 28 February 2013: "I have come to the certainty that my strengths, due to an advanced age, are no longer suited to an adequate exercise of the Petrine ministry." The original declaration was made in Latin. He is the first pope to resign since Pope Gregory XII in 1415. He decided to resign then retired on February 28, 2013 in order to take care of his health condition. In a statistical overview derived from writings by and about Joseph Ratzinger, OCLC/WorldCat includes roughly 360+ works in 520+ publications in 20 languages and 3,00+ library holdings. As Pope, OCLC/WorldCat identifies 1,400+ works in 2,300+ publications in 33 languages and 55,000+ library holdings. A pre-1969 Traditional Latin Mass altar with reredos. The high altar of a church was usually preceded by three steps, below which were said the Prayers at the Foot of the Altar. Side altars usually had only one step. 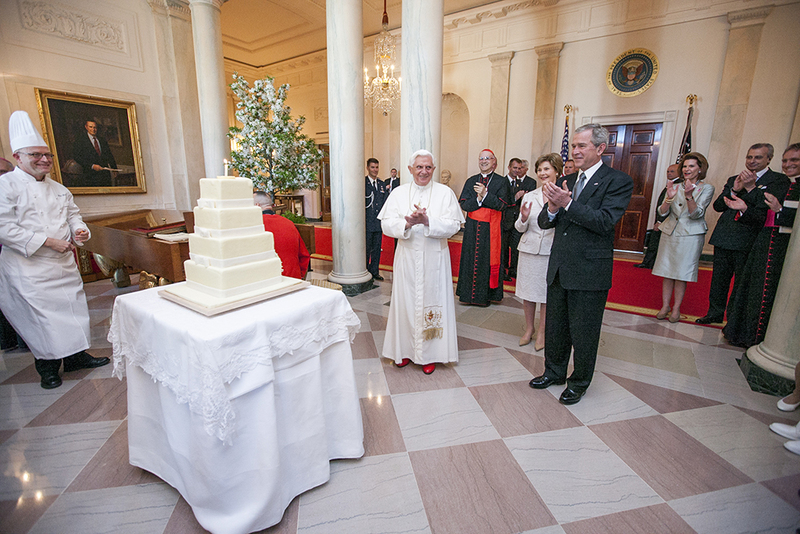 Pope Benedict XVI in choir dress with the red summer papal mozzetta, embroidered red stole, and the red papal shoes. Pope Benedict XVI Facts for Kids. Kiddle Encyclopedia.